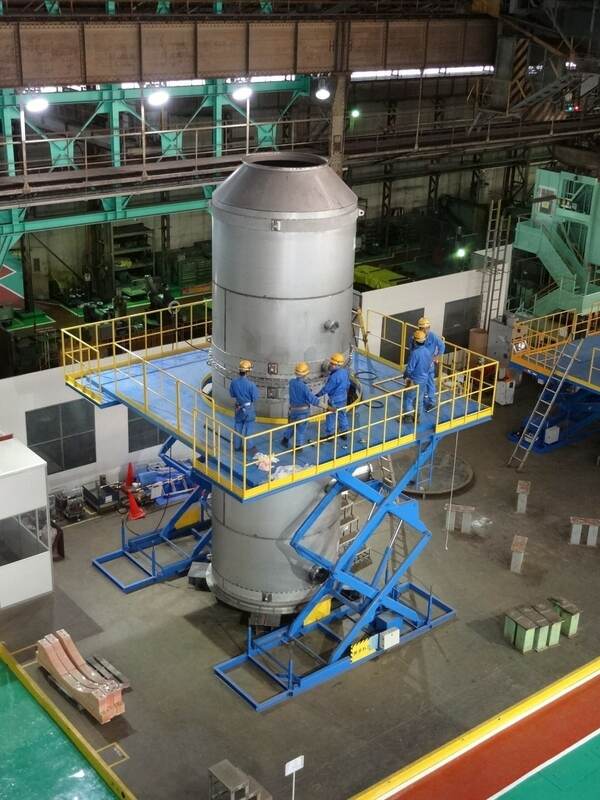 Edison, N.J. – Fuji Electric Co., Ltd., headquartered in Tokyo, Japan; led by President Michihiro Kitazawa, is pleased to announce that today marked the first shipment of Exhaust Gas Cleaning Systems (EGCS) for ships from its Chiba Factory. In the aim of reducing emissions of sulfur oxide (SOx), a substance responsible for air pollution, the International Maritime Organization (IMO) has set an upper limit of 0.5% on the sulfur content of ship fuel oil in most sea areas*1 to be achieved by 2020 (current limit: 3.5%). This regulation will apply to all ships, existing and newly constructed ones. Once this regulation is strengthened, shipowners will have to address this by means such as switching to fuels with lower sulfur content or using SOx scrubbers. Fuji Electric has developed EGCS that is outfitted with a SOx scrubber that mixes exhaust gas with seawater and reduces the sulfur content of the gas. 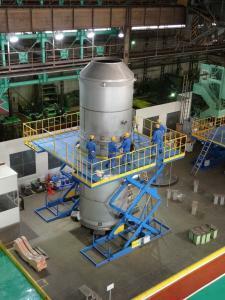 Today, the first shipment of this SOx scrubber left our Chiba Factory. *1 Excluding the seas of North America and the Caribbean, the North Sea, the Baltic Sea, and others. Regulated at 0.1% from 2015. 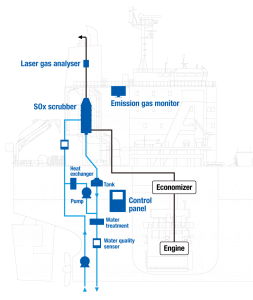 Our EGCS combines a SOx scrubber with a gas analyzer, which measures the concentration of substances in exhaust gas in real time, as well as inverters and controllers that control a feed water pump that takes in seawater. It boasts a SOx removal efficiency of over 98%, and can also be used in the sea areas regulated with a 0.1% sulfur limit. SOx scrubbers made by FE are the first in the world to use cyclone technology in their internal structure. 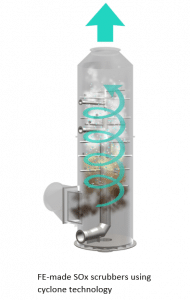 This technology can efficiently bring the seawater (or alkaline chemicals) and exhaust gas into contact by generating a vortex in the exhaust gas and spraying seawater from the pipes arranged spirally (as shown in the lower right figure). This is how we achieved the world’s smallest*2 SOx scrubber. It can be easily applied to existing ships with limited installation space, and the loss of loading space by mounting the system can also be reduced. We hold patents for the pipe structure (branch pipe spiral structure) and spray nozzle distribution. *4 Calculated based on fuel consumption amounts for a 95,000 deadweight tonnage equivalent bulker using fuel prices as of September 2018. Bulkers, tankers, containerships, car carriers, etc. Each size is available in open loop and hybrid types.